Not long ago I invited some friends over for lunch. I had just moved into my new home and they were coming to take a peek. It was a casual meal with good friends, but I still felt like I wanted to set a pretty table. For me, a well set table honors the people you are dining with and is one of the small graces you can add to your daily life to make it a little more pleasant. For this reason, I try to incorporate lovely things on a daily basis and much of this setting comprises my every day dishes. 1. A solid but textured dinner plate makes a great foundation upon which to build your more interesting elements. I often use the same dinner plates over and over, so I stay with neutral colors like white or cream. The plates used here are Mikasa English Countryside. 2. Pick a patterned salad dish to drive the theme of your entire table. This is where I tend to add color and when I buy new, I sometimes buy just the salad plates. The ones used here are Desserts Gourmand from Gien, a pattern that has been discontinued, but you can click for similar Gien plate patterns. 3. A linen napkin can make all the difference in a table setting. 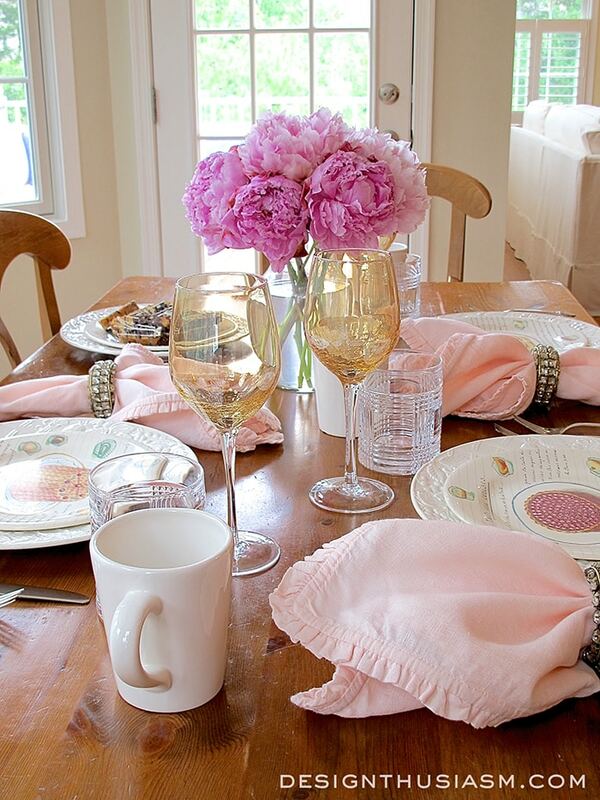 I love the barely there blush pink color of these “Charlie” napkins from Pom Pom at Home. The delicate ruffle adds an extra note of feminine whimsy. 4. 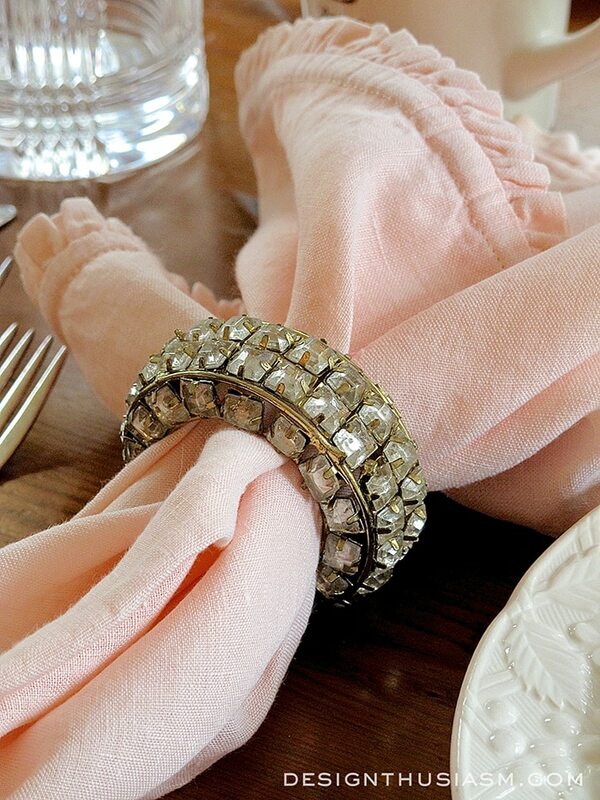 Add sparkle with special napkin rings. The crystal and brass rings above, from Pottery Barn, are amongst my favorites. 5. Instead of match-matchy coffee mugs, add interest with slightly different patterns. 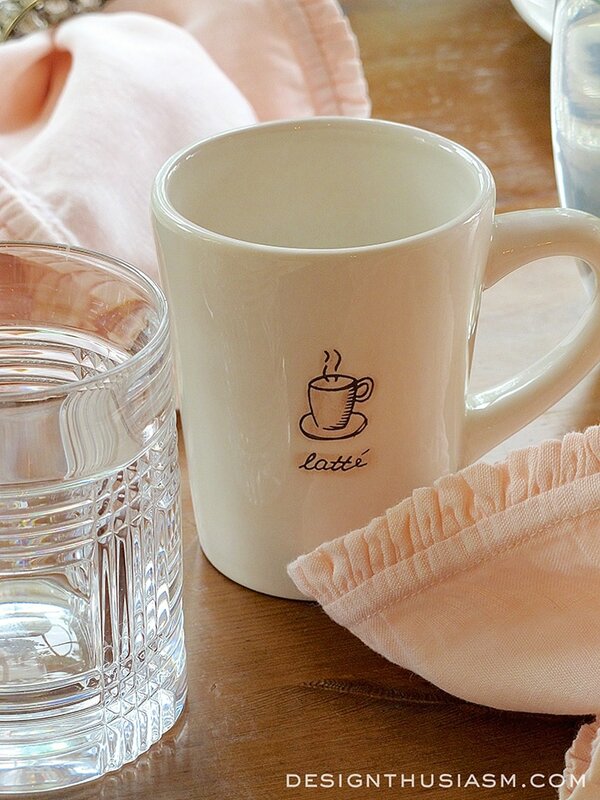 The mugs below work well with the salad plates, in color and spirit, utilizing a casual script and naif drawn imagery. Yet the patterns are not the same at all. The mug set is from Williams-Sonoma. 6. 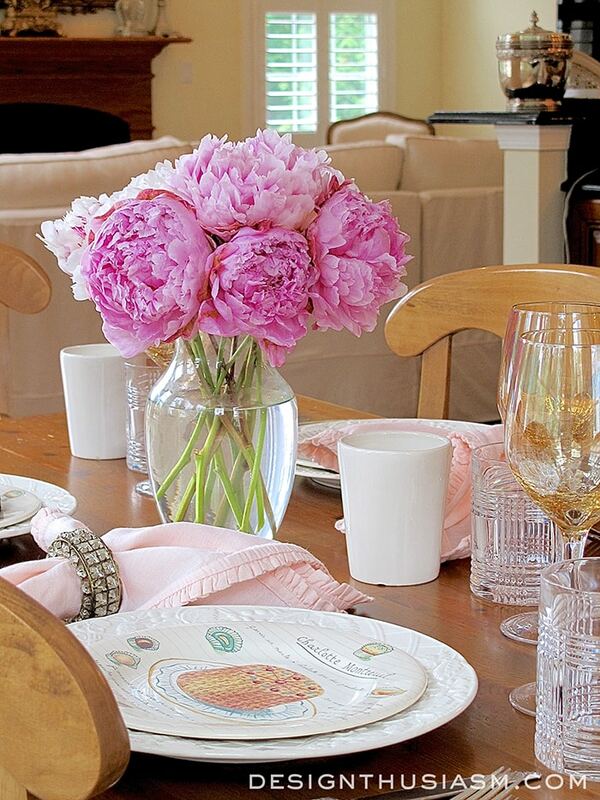 One of the most special elements you can add to any table is fresh flowers. 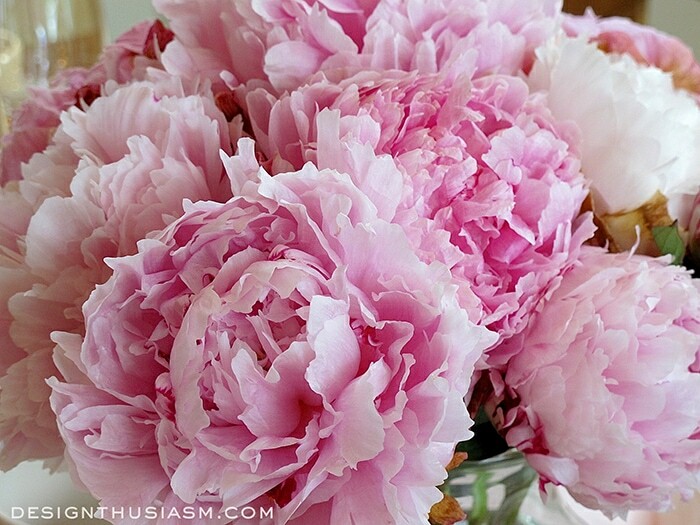 These early summer peonies are my favorite flower. 7. Include wine goblets. I don’t think we actually had wine with this lunch, but it’s always nice to offer the option. 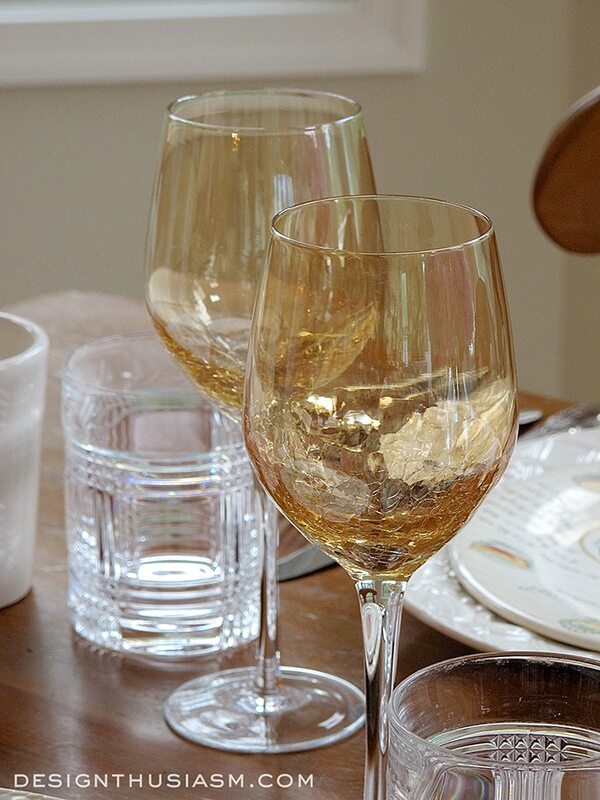 The amber crackle goblets from Pier 1 add a subtle touch of color, picking up the warm tones from the plates. 8. Water glasses in a cut glen plaid pattern bring a nice glimmer to the tablescape. They are from Ralph Lauren and are the glasses I drink from every single day. 9. 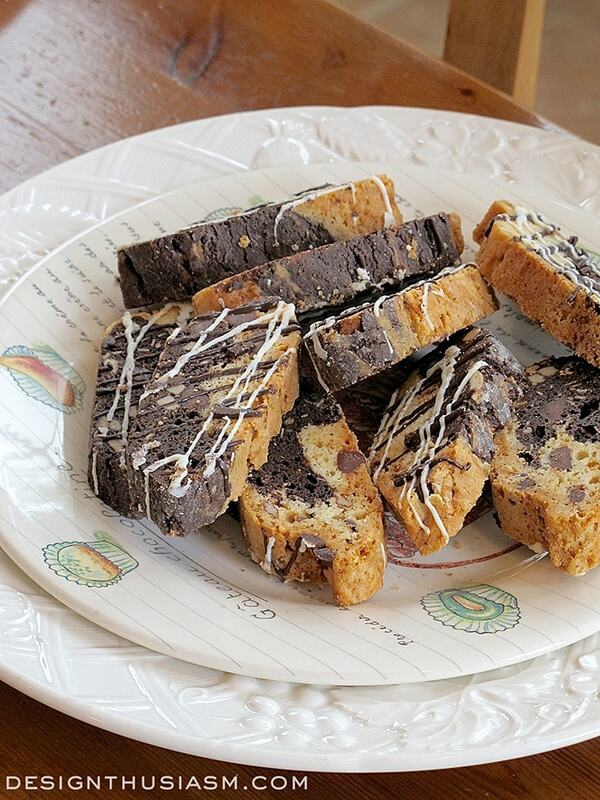 Of course the food you serve helps define the nature of your meal, but one thing that can elevate even the most casual of lunches is a lovely plate of sweets to end the afternoon. 10. Not quite part of the tabletop but crowning the setting, a crystal chandelier makes every event special. This vintage chandy was purchased at a local antique shop and brings just the right note of shimmer to this relaxed get together. A little bit of effort is worth it to me to make a casual luncheon with friends special. It sure beats eating out of plastic containers! Beautiful table, not to fussy and VERY inviting! I love seeing and reading your posts. Looking at your beautiful table is such a nice way to start out the day. I love love love all your décor, your taste and how you display everything. It’s funny, I don’t know you, but feel like I do!! If I had to select just one favorite thing on this table, I don’t think I could. It just all fits beautifully. Thanks so much for sharing. Kathy, I can’t tell you how much I appreciate a comment like that! Thank you so much!! It’s just really nice to know I am reaching like-minded people who my style resonates with… 🙂 Comments like this are what keep me going when I’m not sure I want to continue blogging… lol! Thanks for reading! Lory, Such a beautiful casual elegant table. Perfect for a friendly lunch with the girls. Sharing! I needed this step by step, very helpful! Beautiful table setting and I absolutely love your chandelier. It is stunning! It adds such elegance to your dining room. You make entertaining look so easy but I know like everything it must take planning and practice to do it so well. I would like to suggest a post. I would like to know where you keep your dining ware and accessories and how you organize them, I think this would help me alot. Thanks so much, Kimberly, and I love your idea for a post! I’ve been asked before and I will definitely get on that. We are, in fact, in the process of converting a walk in pantry into a proper butler’s pantry, so that’s where much of my stuff will go, but given that we haven’t started it yet, I do have everything currently stored without it. Will definitely start thinking about writing about that… 🙂 Thanks for visiting! What a lovely tablescape! It is just simply delightful. Of course with the nickname Pinky, you chose all the right colors for me. I use cloth napkins daily, using casual ones for everyday, and nicer ones for guests. I see no need to use wasteful paper napkins and add to the landfill. People often say to me “oh it’s too much work.” How hard is it to throw them in the laundry when you do a load? Setting a table is a lost art it seems. Sadly, my in-laws are not well versed in that sort of things. When ever we eat at any of my husband’s family gatherings, they actually serve right out of the pans sort of buffet style, they don’t use napkins, or paper if they do, they don’t set a table, and for some reason, unless they’re having steak, they don’t use knives!!!! Living in the country/mountains, is a different world for me. They are always so surprised when they eat here on a well set table. Ah, Pinky! We are of the same mind… 🙂 Love your thoughts on cloth napkins. And why not? We throw our towels in the laundry, don’t we? I may have to follow your lead there. 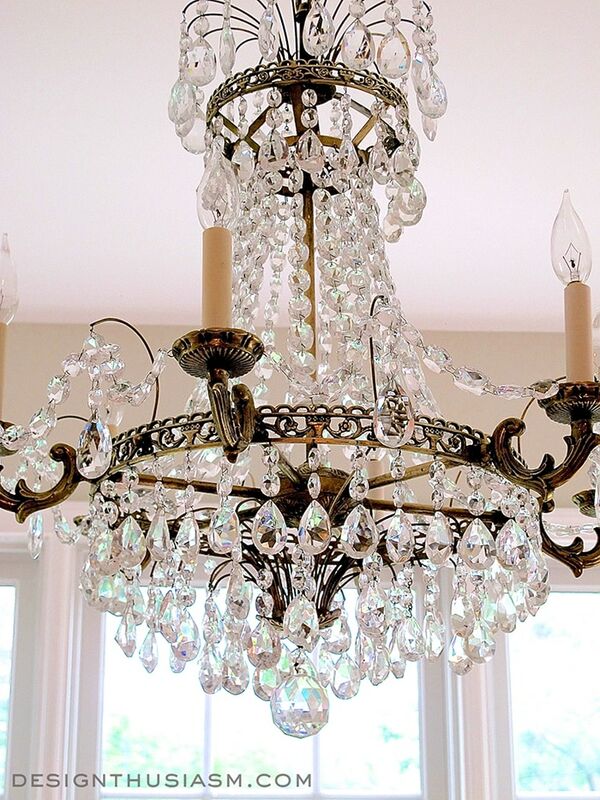 I wrote a post on how I brought this chandy back to life. Found it in an antique shop. Fortunately it worked, but needed to be shined up and lots of the crystals needed to be wired back on. It was a labor of love. I also have an old chandy that was my grandmother’s. I had that one rewired and then dressed with teacups and vintage trinkets. You can find that post on the blog too. Lory: Your “casual” table is so beautiful! I know a lot of people whose “formal” table doesn’t even come close to this! Your blog allows me to indulge pink to my heart’s content. I so enjoy your style! I love those English Countryside dishes. I’m working up to a justification in my head to go out and get them. I already own the Mikasa French Countryside, and my everyday dishes are Williams-Sonoma Traditions, whicth are also white. I mean, how many different sets of white dishes does a person “need?” Except . . . I really love those dishes! Is this a new chandelier? This isn’t your formal Dining Room, right? I really do like it! Thanks so much, Maria! Yes, it’s a ‘new-for-me’ chandelier, bought at an antique market. And no, it’s not my dining room. This is the breakfast room which is attached to the kitchen. As for how many white dishes… lol… well, for my dinner plates, I buy pretty much only white or cream, so they can function as an underpinning for the top plate which is where I do the pattern. So yes, there’s always room for more! You can buy just the dinner plates – not necessary to get the whole set. I’ll have to check out the French Countryside ones… 🙂 And as for pink, I just love it! Funny thing is, in my clothing, I’m generally head-to-toe black (or nearly black), but in my home, no dark colors at all! Thanks for visiting!! I’m a new follower. I just discovered you! What gorgeous photography. And I love this table setting. I have a set of white embossed edged plates I use, too. My thinking is much like yours! I use white as my “anchor” and then add whatever color appropriate for the season, or occasion! And I love pink on the table, too! My house is all white/off white with splashes of color for accent. I love it! I can change up for whatever color scheme/season I want to highlight. I, too, seldom wear pastel or bright color; mostly black/grey or basic neutrals with maybe color in jewelry or scarf. Sounds like our tastes are similar!! I adore European flair and sophistication; and am a confessed Anglophile! Architectural and landscape (especially English gardens and countryside) photography are favorites of mine; and I love travel anywhere! Glad I found you! I’ll be watching!! Hi Jane! Welcome!! So nice to have you here – sounds like we are of very similar minds… 🙂 I always say I am both an Anglophile and a Francophile. My guess is we enjoy similar travel, as well. That’s certainly where a lot of my inspiration comes from. If you enjoy European travel, you can check out the travel section on the blog, too. Thanks for taking the time to say hi! What a beautiful table! The peonies immediately drew me in. I love them so much. Despite being told they wouldn’t grow here, I have been trying. Poor things. The heat is just too much. I guess I will have to stick to TJ’s. I love the feminine feel of this table. Those napkins are such a pretty pink. What a chandelier! Wow! Your statement about honoring your guests with a pretty table is so true. 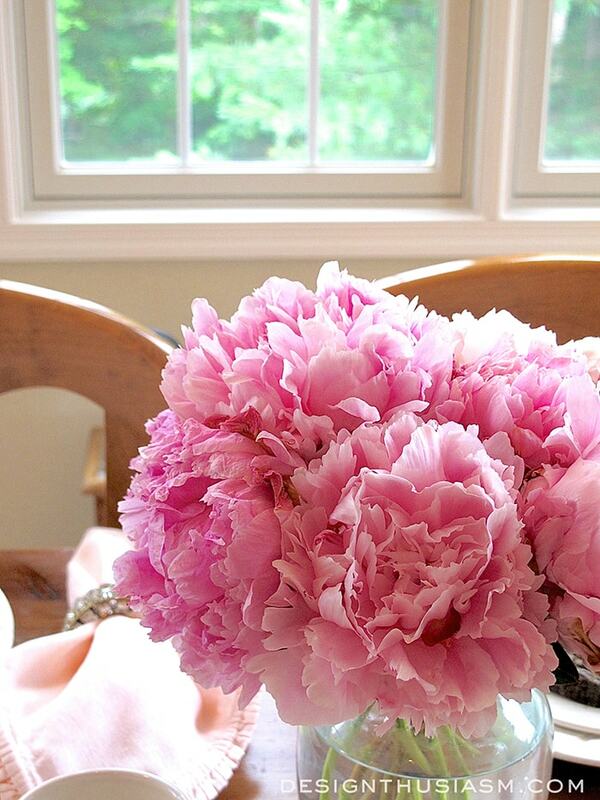 Oh, Barbara, how I wish I could grow peonies. They are by far my favorite flower, but I’m the worst gardener. Thanks so much for your kins words and for taking the time to comment! Great tips…very practical and useful. Love this gorgeous table! Lory, your table setting is lovely. I like using creamy white plates, too, as you can change them up with topper plates…I will sometimes just purchase salad or dessert plates to add the excitement. 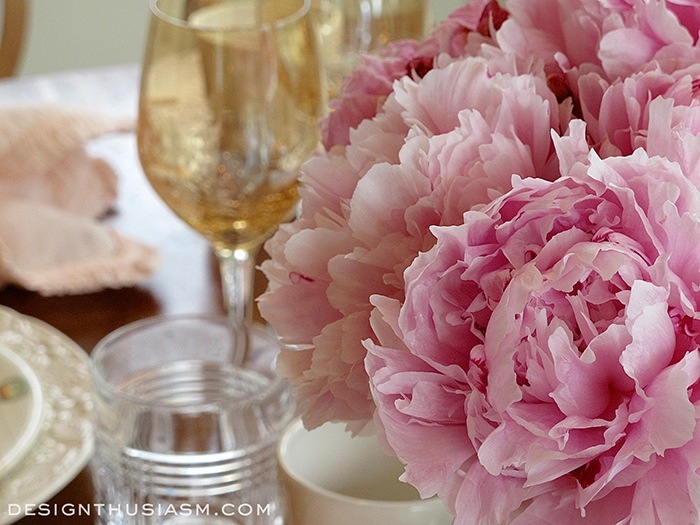 Peonies are my favorite flower and yours are gorgeous! I agree with you that putting the extra effort into your tablescape honors ones guests. It makes me feel good, too, knowing my guests feel special. I can tell from all your posts that you put that extra effort into everything you do and I’ve gotten such great ideas from them, so thank you so much for sharing. Thank you so much, Bobbi! It’s so nice to hear that that comes across – putting in the extra effort. I mostly like to make my home pleasing to me, as well as comfortable for my guests, but it’s really nice when others appreciate the effort, too… 🙂 Sounds like we are of like minds! Now if I could just convince the hubster….The .”what are you dragging alllllllll that stuff out for??? No one will notice”….man. I think Everyone notices…from the youngest to the oldest. My young grandgirls even like to get the good stuff out and set a pretty table. Hopefully that Idea will follow them as they grow up and become home keepers themselves. Ha ha… funniest part of your hubby’s comment is that if *he* notices alllllllll that stuff, then why wouldn’t everyone else? 😉 I agree with you – even if people don’t notice the details, they definitely are affected by the overall impression of a lovely table. I will have to check out the Italian Countryside dishes. Thanks for the heads up, and for visiting!! 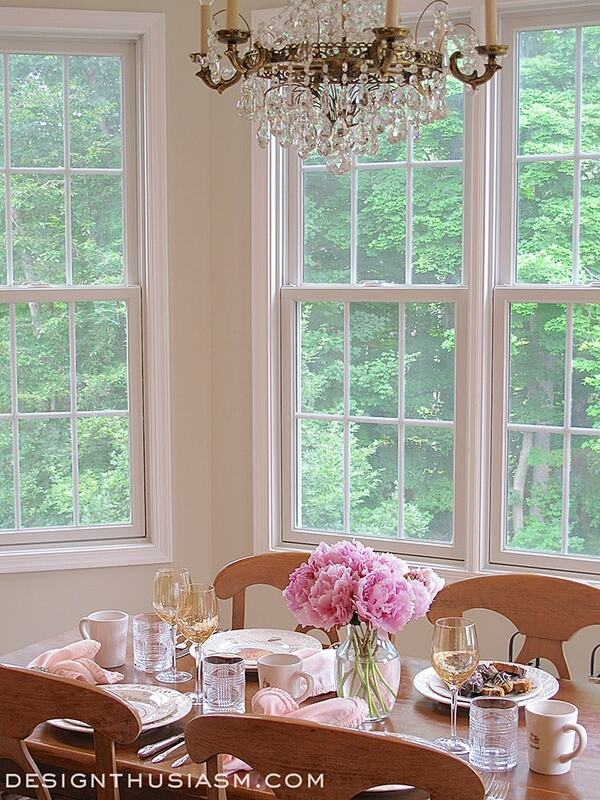 What a gorgeous tablescape – and your chandy is to DIE for beautiful! Great tips for creating a relaxed table. I often just buy the salad plates for my tablesettings. They are the perfect addition to add interest and color to a table without a large investment. 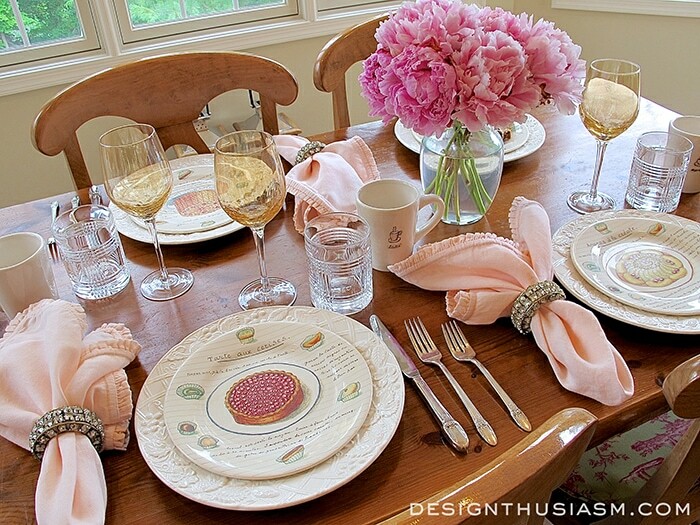 I particularly love the napkins and peonies. 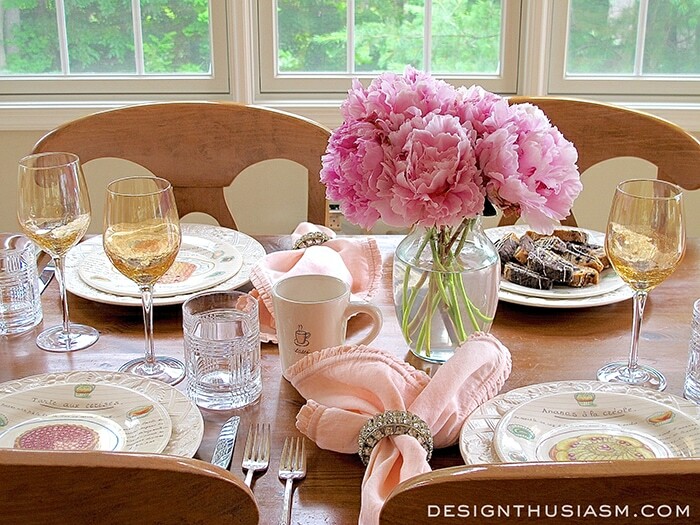 Beautiful table, love the napkins and napkin rings. Always great to review tips for designing a beautiful table. Beautiful as always. Your photo’s are amazing. Don’t know if you will get this comment since this is an older post but I enjoyed this post very much. I agree the matchy matchy of the 1970’s isn’t as interesting as mix and match older pieces with the new and different textures. I was married in the era of 12 place settings including bread and butter plates, salad plates, cups and saucers all matching plus all the serving pieces. Thanks so much, Bonnie! Yes, I get notifications from all comments. Just takes me a while to respond since sometimes I get a bit overwhelmed, but I always read and appreciate them… 🙂 I actually do still try to buy 12 of everything, but I don’t always use them all at once! It’s fun to mix it up, but also sometimes fun to use the full matched set. I love, love, love your blog. You have so many pretty things! I enjoy reading it daily with my tea and scone.